From 1807, when the first Protestant missionary arrived in China, to the 1920s, when a new phase of growth began, thousands of missionaries and Chinese Christians labored, often under very adverse conditions, to lay the groundwork for a solid, healthy, and self-sustaining Chinese church. 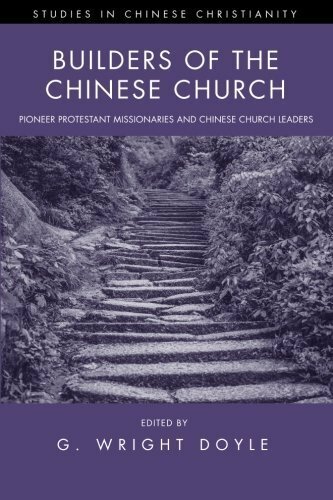 Following an Introduction that sets the scene and surveys the entire period, Builders of the Chinese Church contains the stories of nine leading pioneers—seven missionaries and two Chinese. Here we meet Robert Morrison, the heroic translator; Liang Fa, the first Chinese evangelist; missionary-scholar James Legge; J. Hudson Taylor, founder of the China Inland Mission; converted opium addict Pastor Hsi (“Overcomer of Demons”); Griffith John and Jonathan Goforth, both indefatigable preachers; and the idealistic advocates of education and reform, W. A. P. Martin and Timothy Richard. Readers will be inspired by their courage, devotion, and sheer perseverance in arduous work, and will gain an understanding of the roots of the two “branches” of today’s Chinese Protestantism. All content ©1998-2018 China Institute. All rights reserved.